It's time for Tablescape Thursday at Between Naps on the Porch! I'm going a little outside of the box with this table, as it's not traditional spring colors, but I centered it around the custom made (for someone else) valance that I found at the Humane Society thrift store. I couldn't pass it up for $5 when I had nothing on my breakfast nook window. I don't think it will be a permanent fixture as I can't see it fitting in year round, but I like it for now. It's dramatic black background with spring flowers in toile pots seems perfect for right now. With this table, I decided to use my favorite dishes that I've had for a few years. 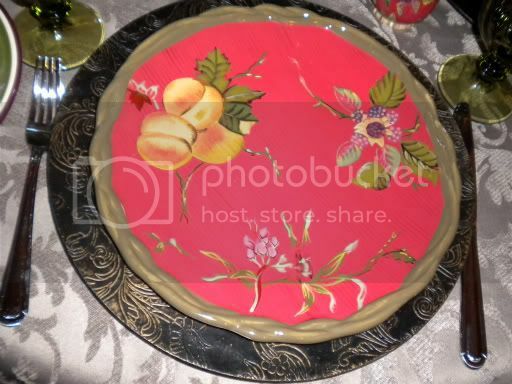 The dinner plates and salt/pepper shakers and mugs are Tracy Porter for Target "Octavia Hill" pattern. The salad plates are Better Homes and Garden from Walmart. You've seen the green goblets before, in my first tablescape. They came from Target and I love them. 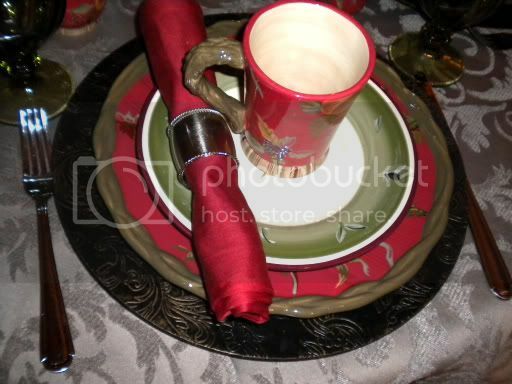 The napkins and napkin rings are from Kohl's. 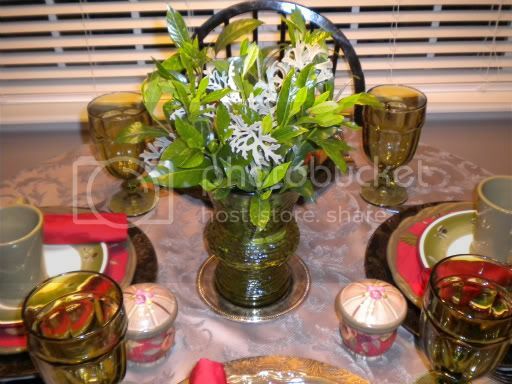 I wanted to keep this table simple, so I used a green Goodwill vase with some clippings from my shrubs and yard as the centerpiece. 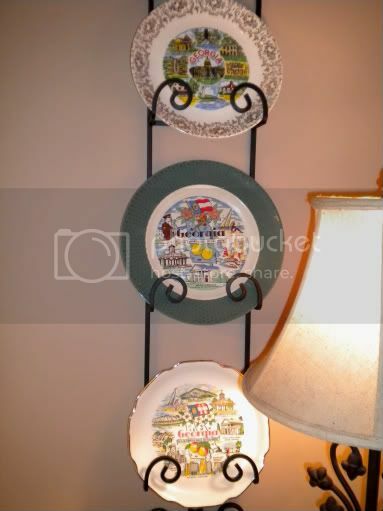 You'll see a few of my Georgia plates hanging on the wall next to one of the things I've had the longest in my house, a lamp that I've had so long that I don't even remember where I bought it. I've got a plant stand sitting next to the lamp with my favorite Pewter pitcher and a new glass jar from GW. Underneath, a green houseplant that I've had for a while sitting on a white plate. We only need one fork and a butter knife, remember I'm keeping it simple! 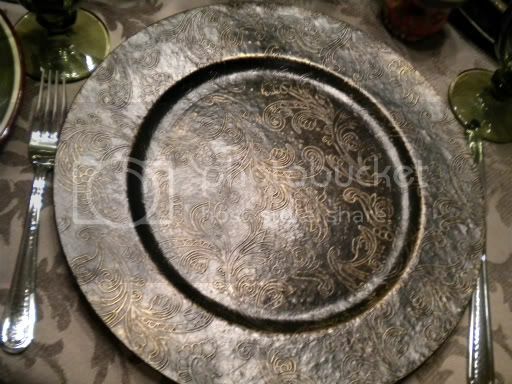 Flatware from Belk's. Tablecloth is Fieldstone Luxury from Target, bottom one from GW. I hope that you like my simple Tablescape and my great window treatment! I love your dining room and your lovely curtains. I have a few of the Tracey Porter pieces myself, they are so pretty aren't they? You did an awesome job mixing patterns too! 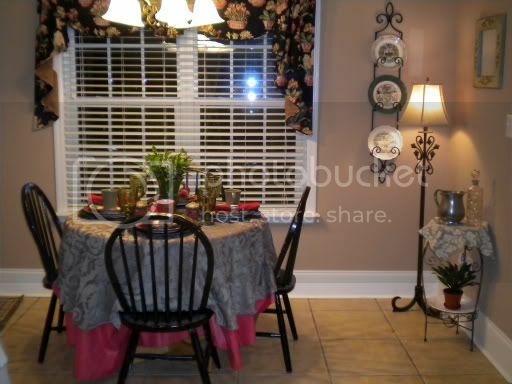 The window treatments and TP dishes are gorgeous! 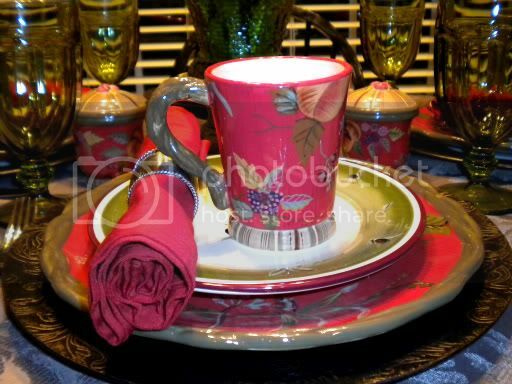 Love the colors used in your table setting. Great chargers. Love your window treatment. The curtain is beautiful! I saw a picture of a shower curtain in that fabric one time on a decorating forum and just loved it. 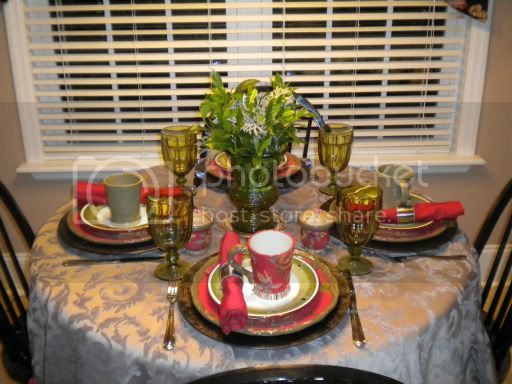 I love all things Tracy Porter, so I think your tablescape is just gorgeous. Your table is so pretty, I love the colors you used. I like the long shot you took from afar, it makes me feel like I'm going to walk up to the table. 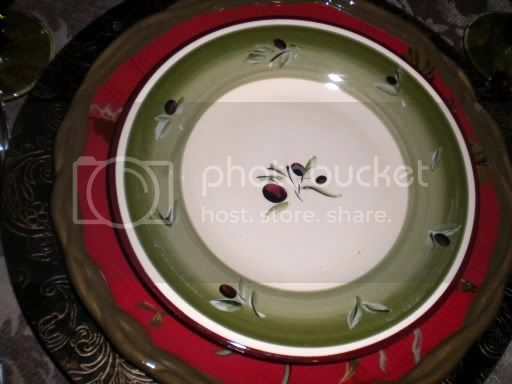 The Tracey Porter dishes are wonderful -- love the colors and the braided-look border. They work so well with the salad plates you chose, too. A very inviting table! I love Tracey Porter...such happy dishes. Beautiful table and window treatments. First of all, I enjoyed your tablescape, BUT..my dear, that window treatment is FABULOUS!!! Where is that store? (couldn't blame you if you didn't share your source), sounds like you found a gold mine! Thank heavens for wall racks. My rack is ever changing and somehow helps to justify all the random (but related) plates I buy. I love the idea of your Georgia plates. Hi. This is not simple at all - this is outstanding. I love your dishes and they went so well with the glasses. Very nice tablescape. And I love your window treatment. Its amazing. Keeping it simple is my middle name. I love your table! Your tablescape is very lovely. I love your china and the way that you placed it all. 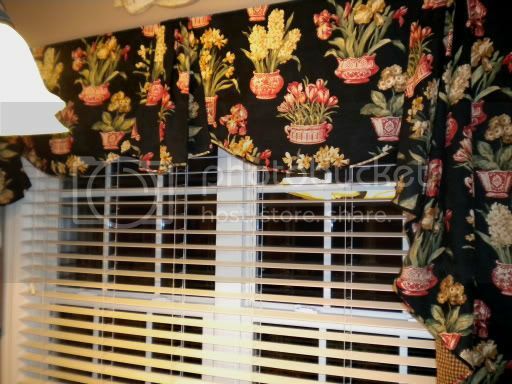 Your window treatments are also very beautiful. I am a new follower and will be back soon. Hope you have a chance to come say hello. I love both the valance AND the tablescape! Such pretty dishes!